The best, most comprehensive book for writers is now completely revised and updated to address ongoing changes in publishing. Published in 2005 as Putting Your Passion Into Print, this is the book that’s been praised by both industry professionals (“Refreshingly honest, knowledgeable and detailed. . . . An invaluable resource”—Jamie Raab, publisher, Grand Central Publishing) and bestselling authors (“A must-have for every aspiring writer.”—Khaled Hosseini, author of The Kite Runner). 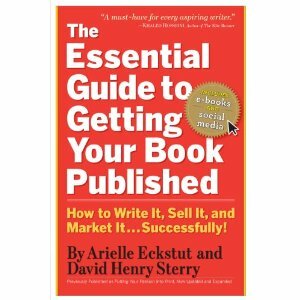 With its extensive coverage of e-books, self-publishing, and online marketing, The Essential Guide to Getting Your Book Published is more vital than ever for anyone who wants to mine that great idea and turn it into a successfully published book.Written by experts with thirteen books between them as well as many years’ experience as a literary agent (Eckstut) and a book doctor (Sterry), this nuts-and-bolts guide demystifies every step of the publishing process: how to come up with a blockbuster title, create a selling proposal, find the right agent, understand a book contract, develop marketing and publicity savvy, and self-publish. There’s new information on how to build up a following (and even publish a book) online; the importance of a search-engine-friendly title; producing a video book trailer; and e-book pricing and royalties. Includes interviews with hundreds of publishing insiders and authors, including Seth Godin, Neil Gaiman, Amy Bloom, Margaret Atwood, Larry Kirshbaum, Leonard Lopate, plus agents, editors, and booksellers; sidebars featuring real-life publishing success stories; sample proposals, query letters, and a feature-rich website and community for authors.